Modern geologists are fond of saying that seismic events/volcanic eruptions at distance along the Pac Rim are not related [causally], however it is of interest that when a cluster of earthquakes/eruptions does happen, they all jump on the bandwagon of trying to predict the next event! Now, this is just fun. HA! With about 400 active volcanoes Io is, according to Wikipedia, the most geologically active object in the Solar System. And as it has no craters (which are assumed to be impact related), the conventional interpretation is that it has been resurfaced comparatively recently. A recent story at phys.org points out that as well as volcanoes and extensive lava plains, Io also has about 100 mountains which take the form of isolated peaks of great height that jut up out of nowhere. These "pull apart" mountains are described as part of a group of "extensional" tectonic features. The researchers postulate that the mountains are the result of a squeezing out process. It is speculated that heat induced compression, ...thermal stress, in the lower crust is the source of both the volcanic activity which vents magnesium-rich silicate magmas (liquid rock) to the surface and, if the volcanic activity is for some reason restricted, then these thermal stresses are thought to be responsible for crustal displacement processes such mountain building. ... It's not just the increasing weight of the overlying lava that puts the deep crust in compression McKinnon said, but also the increasing temperature. "Heating at depth causes the rocks to want to expand, and since there's no room to expand, you again get compressive forces," he said. Alternatively, as extensional/uplift geological activity in crustal material could conceivably result from forces produced by a sub-crustal based expansion process, it may be that these jutting mountains were the result of a more widespread inflation initiated crustal disturbance that also initiated the magma flows to the surface and the ongoing residual volcanic activity. Note that plate tectonic/constant radius theory proposes that Earth's volcanic activity is mainly associated with plate subduction activity but this process is not given consideration in the thermal stress theory and there is no apparent visual evidence (e.g. extensive mountain ranges) for it on Io. These guys are in for a surprise. HA! Don’t we already know how this movie’s going to end? In a potentially terrifying case of life imitating art, the renowned paleontologist who served as the inspiration for Jurassic Park protagonist Dr. Alan Grant is spearheading genetic research that could engineer dinosaurs back into existence within the next five to 10 years, he says. While Dr. Jack Horner, who has consulted on all four Jurassic films, initially believed the key to recreating the prehistoric creatures lied in working with ancient DNA strands, further study about DNA degradation over time has since ruled out that possibility. Instead, a group of scientists at Harvard and Yale have turned their eye to -- wait for it -- the modern-day chicken. “Of course, birds are dinosaurs," Horner told People magazine. "So we just need to fix them so they look a little more like a dinosaur." In an attempt to reverse evolution, the team has already made significant strides in mutating chickens back to the very creatures from which they descended. If that wasn’t enough genetic splicing and dicing, Harvard scientists attempted a similar feat recently by inserting the genes of a woolly mammoth into elephants in order to recreate the extinct beasts. Whoa baby. If the four major differences between dinosaurs and birds are their tails, arms, hands and mouths, Horner and team have already flipped certain genetic switches in chicken embryos to reverse-engineer a bird’s beak into a dinosaur-like snout. “Actually, the wings and hands are not as difficult,” Horner said, adding that a ‘Chickensoraus’ -- as he calls the creation -- is well on its way to becoming reality. “The tail is the biggest project. But on the other hand, we have been able to do some things recently that have given us hope that it won't take too long." Great post, not only are they expanding but I suspect they are all hollow save for a 'central sun' powered by the vast electrical currents involved. If Wal Thornhil is correct that gravity is an electrical property driven by the mobility of electron paths against the rigidity of nuclei creating a charge dipole of every atom, might I go one step further and suggest mass itself is an electrical property, better conceived of as 'charge density' rather than 'mass' as such. This would account for the extra 'mass' of the planet if the current is increasing. I also suspect that the respective intensity of this 'inner sun' dictates the conversion of charge density into actual matter and the nature of the matter produced depends on the intensity of the source producing it, hydrogen and helium for high intensity suns, iron, silicates and aluminium for lower orders of magnitude. Hollow because in the center of a mass all the 'gravitational' forces act outwards in all directions, if planet surfaces are 'gravitationally' bound then an equal force must be acting to hollow the center. There are definitely some beautiful posts about this matter and I did not study this as intensively as some of you in the forum. I would like to add a few points if I may. Wal is not correct when he talks about gravity. Gravity is controlling the center of compressive electrical force. Electricity works in 2 fields. They require a controller and a surveyor and balancing power. This property belongs to gravity which is invisible or spiritual. The idea is in gravity. If it wasn't so, it would be the same as saying a bridge constructed itself. The way I see the atoms would be that protons are in gravity fields and neutrons would be in the amplitude of the wave where proton is changing its polarity and electron would be in an expanding field. All planets, atoms too, grow to a perfect sphere and die slowly oblating - meaning expanding at the equator as Freeman explained. 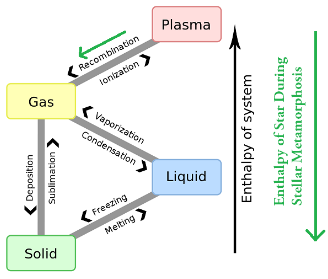 I'm with Jeffrey Wolynski and his General Theory of Stellar Metamorphosis: http://vixra.org/pdf/1303.0157vC.pdf Stars evolve into planets in their cores (Marklund convection - Phase transitions). Stars (plasmoids) are formed from pinches between powerful electric currents, just like in the EU theory. However, in GTSM, stars do not remain externally powered. They are double-layer dissipative systems. Therefore, planets (old stars) cannot be hollow. Jupiter, and hopefully Juno will confirm this soon, has a core. And the gas is recombined plasma. The star is still very hot. That's why its radiation is so high (20 million rads). I beg to differ, think of a spherical system with mass as its attractive component, regardless of the nature of that attractive force, if it is derived from mass it will be acting outward in all directions in the centre of a spherical object, the centre of any mass defined gravitational object has zero gravity at its centre, it is inconceivable that any planet or star could form as a solid sphere without a hollow centre under any model. freemanjack wrote: I beg to differ, think of a spherical system with mass as its attractive component, regardless of the nature of that attractive force, if it is derived from mass it will be acting outward in all directions in the centre of a spherical object, the centre of any mass defined gravitational object has zero gravity at its centre, it is inconceivable that any planet or star could form as a solid sphere without a hollow centre under any model. That's not true according to the mainstream, nor to GTSM. But hey, nobody really knows, so your guess is as good as mine. However, I cannot imagine Jupiter, Saturn, Uranus and Neptune as big balls of gas (or ice crystals) with no core. I would like to use one example: if we watch the Electric Star movie, which is on the front page, in the timeframe of 4:25 minutes or so, we will see the picture of the sun, with 2 magnets from outside and 2 hemispheres of the sun rotating. What I would like to point out is that each hemisphere acts like one magnet. We know that outside there are opposite poles, meaning that the inside is going to be the same. We also know that when you have 2 magnets together it is going to be impossible to have them rotating in different directions. To correct this, both arrows will be pointing in the same direction. If you look at them from the equator, you will see that one is winded clockwise, the other counter-clockwise. This is how nature creates uphill flow. Until we start using our reasoning and due diligence process , we will never be able to comprehend the truth. When one makes a mistake with the basic mechanics, how can we trust all of the other information? We should all utilize this process and those who make the videos should throw some respect toward us so that we would not fall asleep. And this is the screen capture at 4:26 minutes. If you look at the diagram, the red line is the current. The arrows showing right-hand rotation are based on the current flowing in at the poles, and flowing out at the equator. 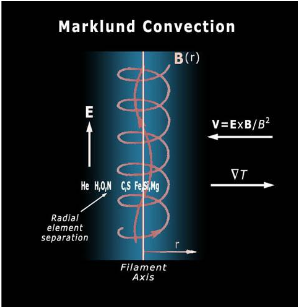 You are thinking of the earlier screenshot of a magnetic field created by a flowing current like at 2:26 minutes. If the current through the Sun flowed like that you would have a massive flow coming out one pole of the Sun, where we actually have a massive current coming out at the equator in the form of the solar wind.